Welcome to 2016. Over the Christmas break I spent some time thinking about what I believe will happen in 2016. I came to the conclusion that there may be about as much bad news as good news over the next 12 months as it relates to the broadcast industry in Canada. Anyone who knows me, knows that I love this industry and have a passion for helping radio stations to be more successful. As I begin my 38th year doing this, I wanted to share some of what I believe will happen in our industry over the next 12 months. Consolidation will continue: The opportunity to grow the number of radio stations a company or individual owns via new license applications in Canada will be even more challenging in 2016 because of a lack of frequencies, and a Commission that appears to want to slow or stall the process. This means for many broadcasters the only opportunity to grow will be through acquiring existing stations. There are a number of stations that are quietly for sale in Canada for the right price, and I expect to see a flurry of activity in 2016. The most activity will be in mid sized media companies who will either grow or divest. More dollars moving to digital: Expect to see even more dollars go to digital in 2016. There are lots of companies, both large and small, selling products and services to retailers in your market today who promise to help grow their business via digital. Radio has a diminishing advantage in that in most Canadian cities radio has local sales people who have strong relationships with the local business decision makers. Radio also has the bricks and mortar in the community and the big megaphone on the hill in the form of a transmitter. But unless radio leverages these advantages and offers clients both radio and digital solutions, I fear that we will end 2016 with even less revenue. The way forward is to find digital solutions that work for retailers and offer them the power of radio and digital. I n many cases the local retailer will prefer to buy from your local reps than a company they don’t know or are calling from another country, provided that your sales reps are well educated on how to sell digital and have the products that will help the local retailer. T here are some broadcasters who are already doing well in this field. Three that spring to mind are Clear Sky Digital, Golden West and Larche Digital, but there are others as well. Disruption will continue in all industries: If you think Uber caused chaos in the taxi industry wait to you see what is coming in 2016. I attended the DASH Conference in Detroit in early November and heard a number of industry experts talking about the disruption we can expect to see in the next few years. For example, Apple’s Carplay is likely to appear in more vehicles in 2016. This product makes it easier for the commuter to listen to their own music, podcasts or audiobooks. According to Apple’s Canadian website soon you will be able to “Access your artists, songs, playlists and your apple music membership using your car’s built-in controls. Or just tell Siri what you’d like to hear.” While the average daily commute is likely to get a little longer in 2016, these commuters may spend slightly less time listening to traditional AM and FM radio because of the likes of Apple Carplay and Google’s Android Auto. As an industry we need to get ensure that all Canadian radio stations can be found on one of the apps that will be included in Carplay and Android Auto. Programmatic ad buying systems for radio will be rolled out in 2016 in the USA and perhaps in some Canadian markets. This allows for real-time biding of advertising inventory, which is likely to reduce the average spot rate. Ad buyers have been using programmatic buying across digital platforms, including Facebook for example for some time. With real-time bidding, advertising buyers bid on an impression and, if the bid is won, the buyer’s ad is instantly displayed on the publisher’s website. Buyers are able to place a buy, and measure the effectiveness in real time based on geography, time of the day, and audience segments. They can make adjustments mid campaign lowering their buy if things are going well, allowing them to reduce the spend but still reach their performance goals. This is very different from traditional ad buying, where the buyer agrees to run a certain number of ads and is locked into a contract. There are a number of companies including Marketron and Wide Orbit who appear ready to roll out programmatic ad buying to television and radio in 2016. Already some brands are taking their buying in-house, and according to Index Exchange internal programmatic ad buying is the fastest growing category of programmatic spending and was up by 15% in 2014, and even more in 2015. If these major brands take all their buying in-house, it will become more difficult to get in front of the advertising decision maker, and could really disrupt the entire advertising agency model as we know it today. The FM Chip will not be turned on in 2016: Turning on the FM chip in cell phones would be great for radio and great for the general public. Everyone has a cell phone, and in times of emergency, radio is often the medium that does the best job of getting important information out to the public quickly and efficiently. If people can listen to radio on their cell phones it would save lives and also help radio reach more listeners more often. But, it requires the cell phone companies as well as the hardware manufacturers to cooperate and unfortunately they do not appear to see the benefits in allowing this. They are also concerned turning on the FM Chip would result in consumers not using as much data and therefore lowering their profits, even though there is evidence from the USA that the data usage is not impacted when the FM chip is activated. I believe that the regulator or the government should step in and demand the FM chips be turned on for public safety. I hope I am wrong, but I suspect that this time next year we may still be talking about it, but the FM chips will not be activated, even though they exist in almost every smart phone on the market today. By the way there are some HTC phones and some Blackberry models that already have the chip enabled. Virgin Radio will disappear in Canada: Bell inherited the Virgin brand and the franchise fees that go with it, but don’t expect this to continue. Television will have a challenging 2016: By March 2016 all television operators will have to offer a pick and pay pricing system or at least a skinny low cost bundle of channels. As more and more consumers move to Netflix or other internet based products the number of consumers watching television programs via cable will become less and less. Also 2016 is likely the year that some of the regional television companies go dark. This almost happened in Hamilton recently with CHCH TV, and unfortunately we may not have seen the final chapter in this saga. At a time when television was struggling because of declining revenues, the regulator forced all television broadcasters to convert to digital in order to free up some much needed spectrum that could be auctioned off to the cellular companies. This upgrade cost the television companies millions of dollars per station, and shortly after that the regulator took away the small market fund that helped these regional companies produce the local programs which in many cases is a condition of license. Unless there is a major change in policy I am told that many of the licenses will have no choice but to turn off the transmitters and close their doors, and some will do so before the end of 2016. HD Radio will become a thing in Canada in 2016: In 2015 there were only four HD Radio stations on the air in Canada, one of them being the station I own in Woodstock Ontario. I believe HD Radio is one way to make radio “cool again” for those people who have HD Radios. The audio quality improvement is impressive, the songs sound so much better, and the rich data you can push to the car dashboard is impressive. There are opportunities to generate revenue via traffic information and geo-targeting coupons or ads. However, the number of cars on the road in Canada that have an HD Radio is still small, and the number of potential listeners who even know they have an HD equipped vehicle is even less. But 2016 will be the year that more HD equipped cars will roll off production lines than ever before. As an industry we need to embrace HD Radio and do all we can to encourage the car manufactures to add HD to their vehicles. By the way the CRTC are eager to see HD Radio get traction in Canada and are issuing experimental licenses via a simple notification process. Industry Canada do require a technical brief. If you have a newer transmitter from Nautel a simple hardware upgrade is all you need to go HD for your AM or FM signal. With HD, you can add additional channels, which is what Corus in Hamilton are doing broadcasting their Fresh FM signal on HD1 and AM 640 on HD2. If you want to know more about HD and how to do it, please give me a call. Radio will continue to be profitable: We will all have to work harder and smarter, but the return on investment for radio will still be better than most other businesses. The most recent CRTC financial performance reports show some operators delivering 34 cents of every dollar to the bottom line. While the industry average spread across 695 AM and FM radio stations is down slightly to 18.5%, or 18.5 cents on the dollar, this is still and a lot better investment than the stock market or putting your money in a GIC at this point. Technology will continue to be our friend: With faster computers, smarter people, and better software tools, radio as an industry will continue to provide a better listener experience and become even more efficient. Listeners and air talent will be able to better interact both on the air, via mobile devices, tablets and websites. One example of the way technology is helping radio announcers can be found in a product called Topic Pulse from Futurimedia. This enables air talent to see what topics are hot for their target audience in their broadcast area so they can relate better both on the air and on social. Young Talent are our future: I recently completed my speaking tour of five broadcast schools in Ontario. Each year I set aside the time to speak to broadcast students who are about to graduate and talk to them about the business, and how to land and keep their first radio job. I am amazed at how many students are enrolled in these courses, and I wonder where they will all find work. I love their level of passion for the business, and their skills across multiple platforms. These students are graduating with not only solid broadcast skills, but are skilled in graphic design, podcasting, video shooting and editing, the web and are social media. We need to get more of these talented broadcasters into our stations and enable them to apply their skills to our products and services, which can only help our business. Conclusion: I hope I am correct in some of my prediction’s and frankly wrong with others. As I said at the beginning, I am a big fan of the business and I love getting out of bed every day to help clients improve their products and grow their brands. I firmly believe that 2016 will be a great time to be in the media business and I wish you every success. I am sure that before every ratings period you remind your staff about the rules and regulations regarding what you can and cannot do both on and off the air during the ratings sweeps. Today comes a timely reminder from Numeris, as a Toronto radio station has been found to be in breach, because one of their staff reacted to a tweet during the ratings. CFXJ-FM “Flow” Toronto has been found in breach of Rule 1 – Ratings Distortion. The breach resulted from an employee re-tweeting and responding to a tweet from a Numeris diary respondent. The respondent posted a picture of their Numeris diary with the following comment, “Best believe am filling in @FLOW93.5 on every page oh and getting paid for it”. The employee re-tweeted the respondent’s tweet with the comment ‘HECK YES!!!’. Rule 1 states that there is no reason for a member to have contact with a respondent and as a result the Radio Rules Committee found the station in breach. The station has fully cooperated with Numeris and reviewed Numeris best practices with their staff, even before requested by the Committee. It should be noted that this violation occurred in the diary service outside of the Toronto market and as a result the Toronto meter commercial service is unaffected. The Rules Committee recognizes that many radio personalities and stations use Twitter, Facebook, and similar sites to maintain contact with their listeners and that station staff can easily get caught up when engaging their audience through social media and not always stop to consider whether each interaction is appropriate. The Committee asked that Numeris let the membership know about Flow’s violation in hopes of preventing similar missteps in the future. We would also like to take this opportunity to review the rules and practical do’s and don’ts related to interactions with survey respondents. Numeris provided the membership with a guide to survey respondent interaction in early 2015 to assist broadcasters in educating their staff. The guide provides practical advice on the application of the Rules and Regulations. A copy is attached for your reference. You can use the guide with your staff or if you prefer a Numeris Member Services Executive can make a presentation to your staff. Remember: It is against Numeris rules for diary and meter participants to reveal their identity to anyone or to contact radio stations about their participation. And, it is against the rules for station personnel to have any contact with diary and meter participants. If you require clarification or have any questions, please contact your Numeris Member Services Executive. This is a study out of the USA but it comes from a very reliable source and contains some very positive news for those stations who target the younger end of the demographic spectrum. When you think of Millennials and media, the first thing that pops in your head is probably a smartphone. Then you may think of a tablet or a laptop. Or maybe one of those cool connected TV devices, such as the Amazon Fire TV Stick or Google Chromecast, or a PlayStation. You probably don’t think of radio when you think of these young people. But probably you should. A new report from Nielsen finds radio has a wider reach each week among adults 18-34 than any other medium. Radio has been touting its high weekly penetration forever, but it often gets compared to monthly figures from digital and TV. Nielsen’s inaugural Comparable Metrics Report leveled the playing field and showed that radio has the highest weekly reach across all age groups, as more than 90% of all adults listen each week. Results from the study showed that adults still spend the most time with TV, with radio coming in second place across almost all groups followed by smartphones, PCs, TV-connected devices and then tablets. *DVD, Game Console, Multimedia Device, VCR. Not only does the comparable metrics report look at how many people tune in but also how often they tune in. 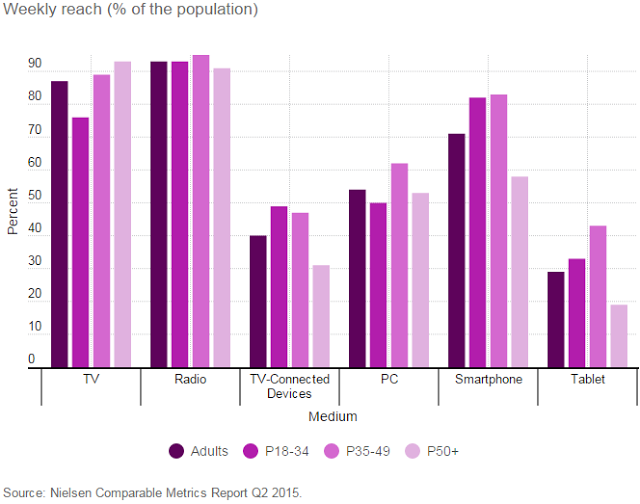 Radio and TV usage amounts to more than five days each week. And, while some media have seen decreases in usage, radio has posted the most consistent minutes of usage across all ages. So who tunes in the most? When we look at weekly usage by race and ethnicity, African-Americans and Hispanics dominate, spending more than 13 hours listening to the radio. Hispanics are the most avid listeners, tuning in for 13 hours and 36 minutes each week. When marketers and ad planners look at their choices, TV digital and radio are typically the first three media options. According to several eMarketer reports, TV will account for 37.9% ($74 billion) of the total U.S. media ad spend in 2015, followed by digital with 31.6% ($61.7B) and radio with 8.2% ($16 billion). Nielsen’s AdIntel data affirms this finding, and in the first six months of 2015, TV ad spend exceed $39 billion. The Comparable Metrics Report shows that the average adult spends 775 minutes in a typical week with radio. Add that to the 1,950 minutes for TV and 972 minutes for digital and you see that radio commands 20% of total time spent. However, when ad buying decisions are being made, radio only attracts 8.2% of the total U.S. media ad spending share. Demonstrating advertising effectiveness is key to attracting more ad dollars, and radio is just getting started. In fact, a recent Nielsen sales effect study found that radio could generate up to a $17 return for a 1$ investment. As an influential voice in consumers’ purchasing decisions and the last medium they listen to before going shopping, radio can really move the needle for advertisers looking to grow their business. The Comparable Metrics Report set out to eliminate confusion across mediums and provide clarity in the form of ‘apples to apples’ metrics. As a result of its greater weekly reach, the report reaffirms radio as a critical medium for advertisers and levels the playing field for radio to compete for a larger share of the advertising pie.